Virtus beats EG for the third time in a Major bracket. In the last two Majors, Evil Geniuses, Team Secret, and Virtus Pro have taken the top three spots and are already locked in for The International 2019. Secret and Virtus have traded blows, each placing first once while EG has finished third at both The Kuala Lumpur and Chongqing Majors. In both instances, Virtus has been the team EG just can’t seem to overcome. Secret has beaten them in bracket too, but Virtus has been the more consistent roadblock for the top North American squad. After besting Virtus at MDL Macau 2019, EG looked poised to finally knock out their tournament demons during a Major. Virtus continued the trend of poor showings during opening games, leading to an absolutely massive victory for EG. Artour “Arteezy” Babaev pulled off another solid game on Lycan along with Andreas “Cr1t-” Nielsen who pushed hard on Pangolier. But like Virtus showed in their series against Chaos Esports Club, the first game amounts to nothing if their opponent can’t close things out. Things got heated in game two as both sides battled for over an hour. EG did well adapting to what Virtus was throwing at them, but after about the 40-minute mark they started struggling in team fights. Virtus closed out the second game and from there they worked to close the series too. EG tried to bounce back from the close loss, spacing out and trying to keep things under control as Virtus got aggressive. That didn’t work out well for them and Virtus got some nice early kills and forced buybacks in tough spots for EG. After 35 minutes the deal was sealed and Virtus capped another comeback to secure a top-six finish. After the match, however, it became clear there might have been several violations by Virtus during the drafting stage of both games two and three. DreamHack confirmed that during game two, a Virtus player was allowed to exit the stage to use the restroom. This was allowed by the admin on Virtus’ side, but the player had to cross the stage near EG’s side, meaning there was potential that he overheard some of their strategies. A similar thing happened when the draft for game three starte. Three Virtus players were still outside at the time, leading them to walk past EG while the draft was underway. 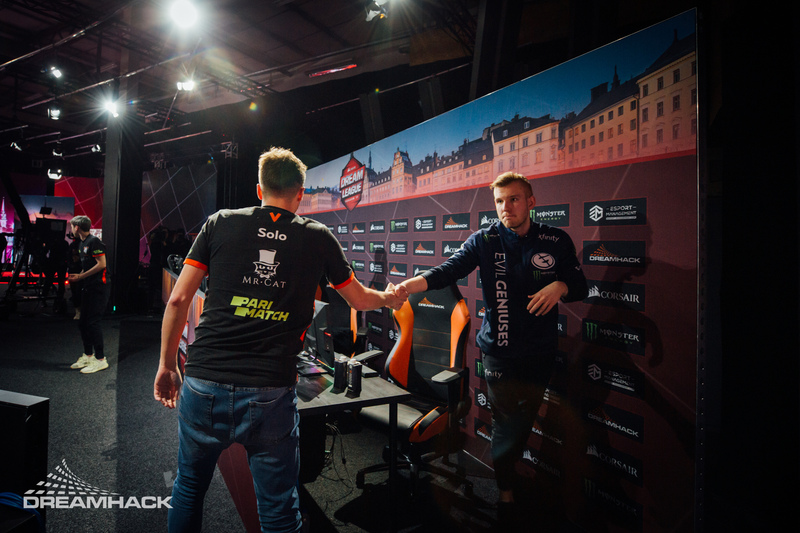 It’s impossible to prove if these instances actually affected the outcome of either game, but DreamHack said it will change its rules to ensure this doesn’t happen again. Virtus now awaits the loser of LGD Gaming and Vici Gaming which will kick off the main event on March 22 at 10:30am CT at the Tele2 Arena in Stockholm, Sweden.